I didn’t think Lisa was into…those…video games. With new soldiers coming in, of course Vanessa and Kim want to go check them out, but poor Sammie is stuck working at the diner. Of course, Lori remind her that all of those soldiers will be coming to the diner to eat and she’ll be up close and getting tips, so maybe she’s winning out. She also thinks Rolf sent her the flowers (after figuring out where the flowers originate), not realizing they’re intended for Lori. Rolf doesn’t get a chance to inquire further about Lori when he and Lisa are brought to the commander to be given the rank of Lieutenant, which if the rules don’t change they’ll keep when they graduate. What they got right: A bit sappy but the opening sequence is nice as Lisa writes to Karl about a sand SDF and comparing it to current events. The “terrible trio” are always fun to watch in their boy-crazy ways. Even the training scene and Rolf kidding with Claudia about Roy are rather amusing. What they got wrong: Why does Claudia have a ponytail? Correction, HOW does she have a ponytail when her hair doesn’t seem to grow long, just out? It’s also sad to see this series end so soon when it still has potential. We’ll get a one-shot follow-up down the line and that’s it. The other titles (only one of which we’re reviewing in this period) will be continuing for a while after this. Recommendation: A good series, with potential in following the cadets that we don’t get to see. It’s not super great but worth looking into for Robotech fans. Posted by ShadowWing Tronix on December 21, 2018 in Animation Spotlight, Television Spotlight, Yesterday's Comics and tagged Academy Comics, Kim Young, Lisa Hayes, Lori, Robotech, Robotech: Academy Blues, Rolf Emerson, Sammie Porter, Vanessa Leeds. Some women wear ponytail weaves. They’re made out of real hair, but it’s somebody else’s hair that a woman is wearing in the ponytail or hair extensions. They sell them in stores that specialize in beauty products and hair supplies. Do you remember Claudia ever using them? She didn’t in the show and this is the only comic I’ve seen with her having a ponytail. No, Claudia never had a ponytail in the cartoon or Comico comic books. 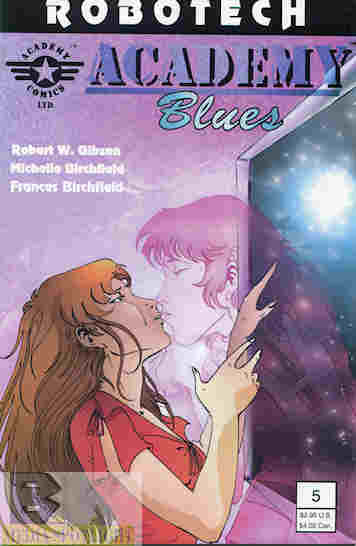 But do recall that Robotech comic books, starting in the 1990s, have made some changes to the tale. For instance, Titan’s current Robotech series has made significant changes, especially just in issues #14 and 15. Let’s put it this way: Roy Fokker’s evil clone has murdered TR Edwards in the prison cell. Plus, an evil assistant to Dr. Lang has called upon the Invid to show up. Yes, the Invid have actually appeared at the end of issue #15 of Robotech! Hey, kids….this is definitely isn’t your father’s Robotech! After seeing that the Invid have appeared as early as issue #15, I am very curious and intrigued about what’s going to happen next. Simon Furman has gotten me hooked on this new vision of Robotech. So yes, the decision has been made….I will continue to collect Titan Comics’ Robotech series in order to find out what happens next with each issue because I have no clue what will continue to happen. I actually like it. This is the only comic where Claudia has long hair that can be put into a ponytail. None of the other books in the Academy run to this point and I’d wager since unless the same artist shows up has her with this kind of hair. Her hairstyle is the same as in the show. This remains something they got wrong.